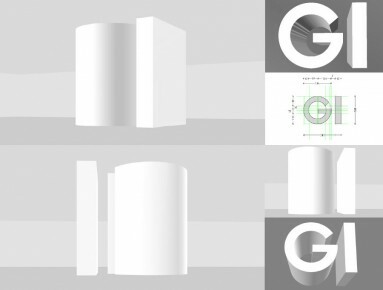 The two letters “GI” form the ground plan for the massive sculpture in the Goethe Institut in Mexico City. The letters are not directly legible. Instead, they can only be deciphered as an extension between the floor and ceiling. On location “GI” automatically stands for Goethe Institut. With the title “Government Issue” a military field of meaning is connoted. The massive form can be understood to be a part of the existing architecture or be seen as a ceiling-high, walk-in sculpture. It has two directions of association: first, of course, the initials of the Goethe Institut; and secondly as the initials of “Government Issue”. Understood as government output, the civil-service idea of transporting culture in the name of Goethe is placed on a strategic level with war-time compulsory military service as GI in the name of an american government. The deceptive nature of differentiating between times of war and times of peace, between soldiers and authors is momentarily overcome in the symbolic equalization and becomes thought-provoking.